You can tell by Nothando’s sad eyes that she wants to tell you something. But she can’t control the muscles in her mouth and tongue. She doesn’t know sign language because no one taught her. Nothando is a beautiful young 22-year-old woman who won’t learn to drive a moped or car. She won’t meet with her friends at a local hang out. She can’t walk. Nothando was born with a condition that’s affecting her nerves and muscles. Due to unaffordable or inaccessible medical care, she was never tested. Or diagnosed. Or treated. Then, someone like you stepped in and improved Nothando’s life. You gave a donated, free wheelchair and someone else paid to have this miracle shipped to Nothando. She can now see the world from an upright position for the first time. You can tell by her eyes and her squeals that she’s excited when she watches the children playing and the animals roaming around. And, this wheelchair isn’t just a gift for Nothando. It’s also for her mother. Nothando is no longer trapped in her home because her mother can take her out in her wheelchair. Nothando can now join her mother while she’s doing her chores, visiting friends, going to church or just sitting outside enjoying the sunshine and fresh air. Because her mother can easily move Nothando about, she now has more time for her other children. 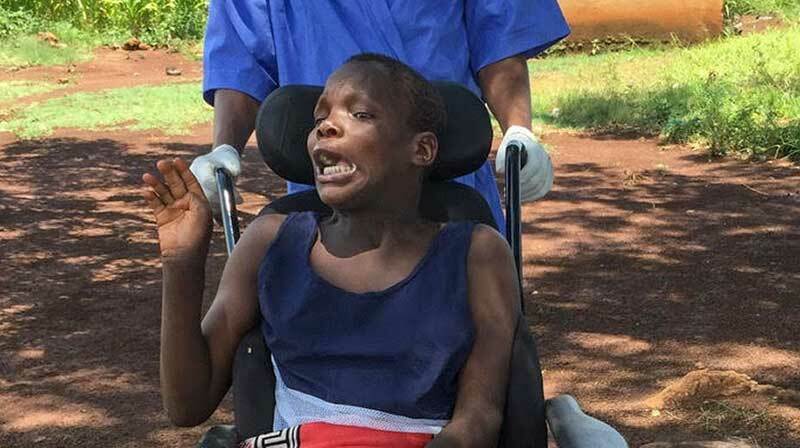 Nothando may not be able to speak…but the look in her eyes tell you that she’s incredibly grateful for her wheelchair. One wheelchair for one young girl is a life-changing gift for the entire family. Do you know what you could do with Can$100 around the world?